This chapter will be a continuation and combination of what you learnt from the chapters Coordinate Geometry and Vectors. As we come into 3 dimensions, we make use of vectors as it makes our analysis much easier. Here, we introduce the coordinate systems for three-dimensional space ℝ2. The study of 3-dimensional spaces lead us to the setting for our study of calculus of functions of two and three variables later in University. I think you should be familiar with this rule in Physics. When your fingers point in the direction in the x-axis, and make it curl towards the y-axis, then your thumb will be pointing to the z-axis. Try to get used to this setting: with the z-axis pointing upwards, x on the left, y on the right. A point P in space can be represented by an ordered triple (a, b, c) where a, b and c are projections of the point P onto the x-, y- and z-axis respectively. The three dimensional space is also called the xyz-space. 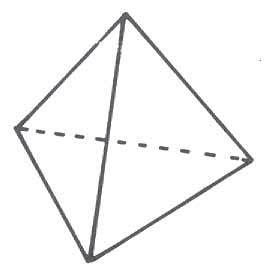 We say that two vectors are orthogonal to each other when they are perpendicular to each other. Two vectors a and b are orthogonal if and only if a • b = 0. In 3D, we say that a vector a is orthogonal to vectors b and c if a is perpendicular to both b and c.
The component of b onto a (or scalar projection) is the resolved part of a in the direction of b. This means that when we have 2 vectors a and b pointing at 2 different directions, with their tail of the arrow connected to each other, the component of b onto a is the length of the orthogonal projection of b onto a.
and according to the picture above, it is the length of PS. We write the notation proja b to represent the projection of b onto a. Remember that the answer is a VECTOR, not just a VALUE. and therefore you can deduce the angle between the vector and the x-axis & y-axis respectively. The cross product yields a vector (it has a magnitude and a direction), which is orthogonal to both the original vectors. In trigonometry, the cross product a × b = |a||b| sin θ. You can use the right hand rule to determine the direction of the cross product. Point your fingers to the direction of a, curl it towards the direction of b, then your thumb points in the direction of a × b. This information is very important we come to the section on planes. Different from the dot product, any vector cross itself yields zero. Probably (vi) is hard to remember. (vii) is just the definition of the dot product, where the dot product of 2 orthogonal vectors equals to zero. Also take note that the cross product is not commutative. Reversing the a’s and b’s will result in an extra minus sign. Product of vectors, cross product, scalar product, dot product, vector product, properties of vector product.